What Is the African Union's Role in the Sahel? 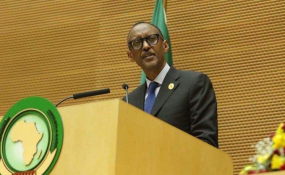 President Paul Kagame at the 30th AU summit held from Jan. 22 to 29. Addis Ababa — For Africa to combat the threat of transnational terrorism on the continent, it must employ a multi-dimensional approach, President Yoweri Museveni has said. Speaking at the Peace and Security Council Meeting in Addis Ababa, Ethiopia, Uganda's President Museveni said the approach had to address issues of ideological disorientation, employ the right anti-terrorism strategy, use appropriate equipment, enforce cooperation and fix the poverty question. The Peace and Security Council (PSC) meeting is one of the high-level engagements that preceded Sunday's official opening of the 30th African Union Heads of State Summit. Egypt is the current chair of the PSC, whose meeting theme was "Towards a Comprehensive Approach to Combat Transnational Threat of Terrorism in Africa". Making his remarks, Museveni said: "One point that must be emphasized is using ideology to stop radicalization. Terrorists get wrong ideas based on identity either of religion or tribe. This wrong ideology leads to wrong politics which in turn leads to insecurity and terrorism." President Museveni added that the strategy employed in combating terrorism is critical. "When fighting terrorism we should remember that they do not fight conventional wars. Terrorists use irregular tactics and go for soft targets," he said. "How then do we protect these soft targets; the innocent people in villages, churches, etc.? We must look at this angle." He also told the meeting that it was important to look at the technical issues like tracking suspects and employing appropriate technology and equipment, enforcing cooperation among states, especially on intelligence gathering and sharing but importantly work to get Africans out of poverty, which lures, especially the young people into terrorism. "How do we ensure economic development? How do we end poverty and develop our people? We must address all these. It must be a multi-dimensional approach," said President Museveni. "Terrorism affects the development of our people. The success in combating terrorism therefore gives hope to our people," he said.